Pack Evooleum - Olive CloudShop S.L. Discover the best EVOOs in the world according to the international awards to the quality of the extra virgin olive oil EVOOLEUM awards. 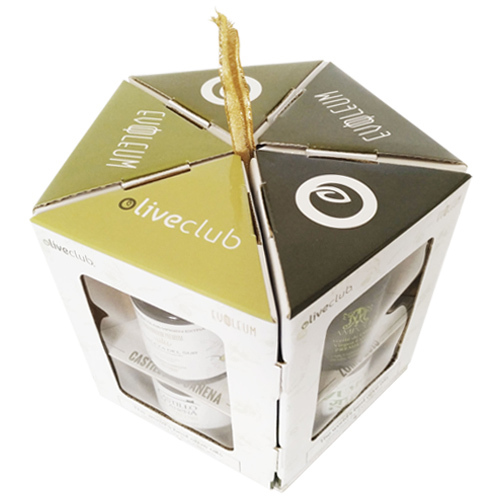 The presentation of the exclusive PACK EVOOLEUM is made in a pentagonal box. When opening, it unfolds in five triangles and in each one of them we find two bottles of 50ml with the information of each producer and their notes of tasting on the back side. The awarded olive oils included in this edition are: Castillo de Canena (Picual and Early Royal), Morellana, Cortijo la Torre, Nobleza del sur, Venta del Barón, Monte Rosso, Campolea, La Gramanosa y Quaryat.